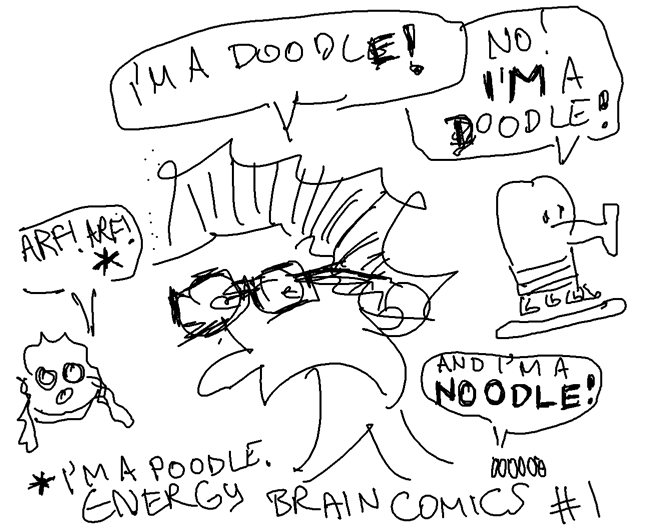 This was the crude doodle (pun intended) that started it all. One night in spring 2011, while my son Leon and I were fooling around with our Wacom tablet, he said: “Draw something completely crazy and call it Energy Brain Comics.” This became a tradition, and a few weeks later we decided to create a website, to upload the comics, and to draw them regularly. The comics have since become more colorful, and there’s a story arc going on (even though there are often specials in between the regular, ongoing plot line). Previous Previous post: Hi there! Energy Brain Comics #215: What If Metrotopia Had A Zombie Apocalypse?